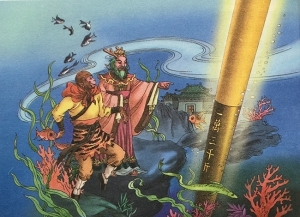 Journey to the West is one of China’s Four Classic Novels. 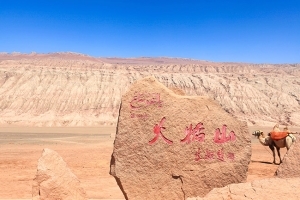 Written in the 16th century, it tells the story of a Tang Dynasty monk and his magical disciples on their pilgrimage to bring Buddhist scriptures back to China. Along the way, the foursome must overcome 81 tribulations to complete their spiritual cultivation paths. Many of their troubles derive from the fact that there are demons and monsters at every turn set on capturing the Tang Monk for a taste of his flesh, because one bite is said to grant immortality. As we can see from this following episode, it can be difficult to be popular. 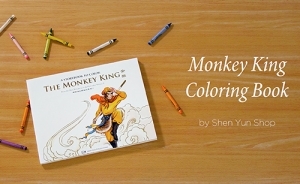 Good thing the magical Monkey King always has his master’s back! One sweltering day, the Tang Monk, Monkey, Sandy, and Pigsy arrive in a land of only women. Approaching the riverbank, they see a group of villagers gathering water into their jugs. Pigsy dashes towards them to beg for a drink. But at the sight of the half-pig half-man careening towards them, the women make a hasty flight. Unfazed, Pigsy pulls out his own alms bowl to dip into the river, and chugs it down in one gulp. Suddenly, his stomach begins to cramp. Then to his horror, his already portly belly doubles in size. An elderly passerby sees Pigsy’s distress and approaches the pilgrims. “Did he drink from the river?” asks the old woman with a twinkle in her eye. She explains to them that in their land of only women, the locals come here when they want to bear children, because one sip of the water is enough to impregnate a hopeful mom. “You are going to have a baby,” the woman concludes. The woman tells them they must appeal to the queen for an antidote. The pilgrims thank her and hasten to the palace. While Pigsy, his brethren, and master are waiting for an audience with the queen, unbeknownst to them, something sinister is coming their way. Inside the splendid palace gardens, her highness is lounging with her entourage of court ladies, when, suddenly, an ominous haze covers the sky. Strange, jarring vibrations radiate through the air, and one by one the fine ladies drop to the ground unconscious. Then the culprit—a giant scorpion demon—reveals itself, continuing to blast hypnotic waves from its stinger. The demon scuttles onto the queen, and its spirit takes possession of her body. This was no random act of malice. The demon has an agenda. Its goal is to capture and eat the Tang Monk—who at present is still waiting to meet the queen. Just then, Tang Monk, Monkey, Sandy, and the mortified and expecting Pigsy are led to court. On seeing the pious monk, the scorpion-queen is ecstatic. 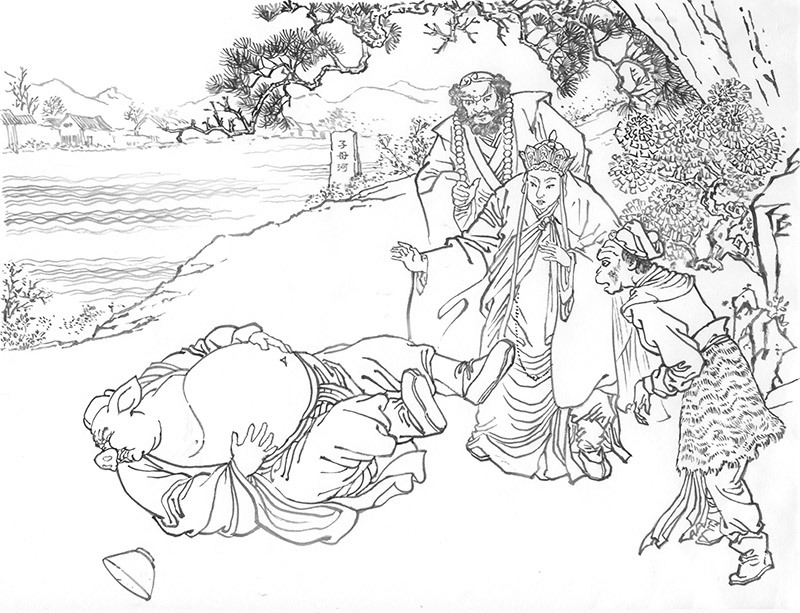 She tells the pilgrims she will cure Pigsy and allow them continue on their journey, but only if the monk agrees to marry her and stays to become king. On hearing the deal, the monk refuses adamantly. “I am but a humble monk,” he insists. “The wealth of the kingdom will be yours,” says the scorpion-queen slyly. To the surprise of all, Monkey entreats his master to accept her proposal. The delighted queen calls for the antidote. Pigsy downs it eagerly, and his stomach quickly shrinks back to its normal pudge. Tang Monk, however, turns to Monkey much vexed. 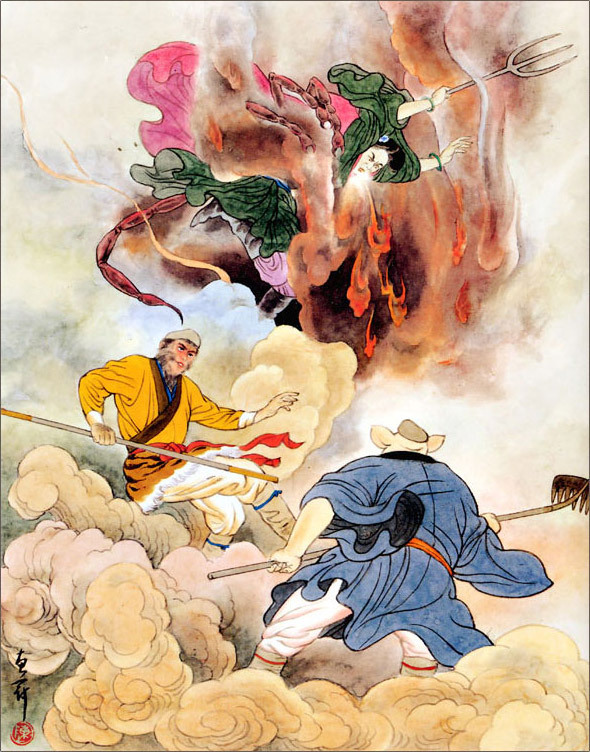 Tang Monk scarcely has a chance to reply before the scorpion-queen whisks him away. True to his word, Monkey secretly follows them inside. 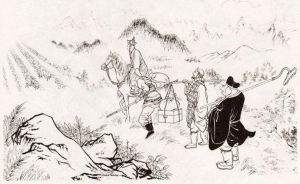 As soon as the last guard has withdrawn, Monkey tells his master to hide, then transforms himself into the monk’s exact likeness to wait for the queen. In no time, the scorpion-queen reappears, mouthwatering, for her monk. The disguised Monkey doesn’t keep up his act for long. Outraged at her advances, he transforms back into his true form and pulls out his Golden Cudgel to strike. Realizing she’s been tricked, the demon seizes her trident and the battle begins. Monkey plucks four hairs from behind his ear, and, with a magical breath, transforms them into monkey replicas. The possessed queen counters by conjuring four little scorpion demons of her own. In no time, Team Monkey subdues the scorpion minions, and Monkey King corners the queen. With one whack from his cudgel, she crumples to the ground and the evil spirit oozes out of her body. Back in its original form, the scorpion demon begins blasting its signature sonic waves again. Monkey creates a magical shield to block the attack. Then summoning all his strength, he fires an intense beam of energy straight into the scorpion, and vaporizes it for good. An ancient Chinese expression says, "there are deities three feet above one’s head” (三尺頭上有神靈), meaning the divine are always watching over us. At that moment, a Taoist deity appears from the sky and revives the queen to her true self. Then the deity returns to the heavens as suddenly as he appeared. Finally herself again, the queen offers the monk and his friends her heartfelt gratitude and any luxury they could wish for. But after this uncanny delay, the four pilgrims are simply glad to be reunited—and with no one engaged or expecting. Their only wish is to resume their holy quest as soon as they can. 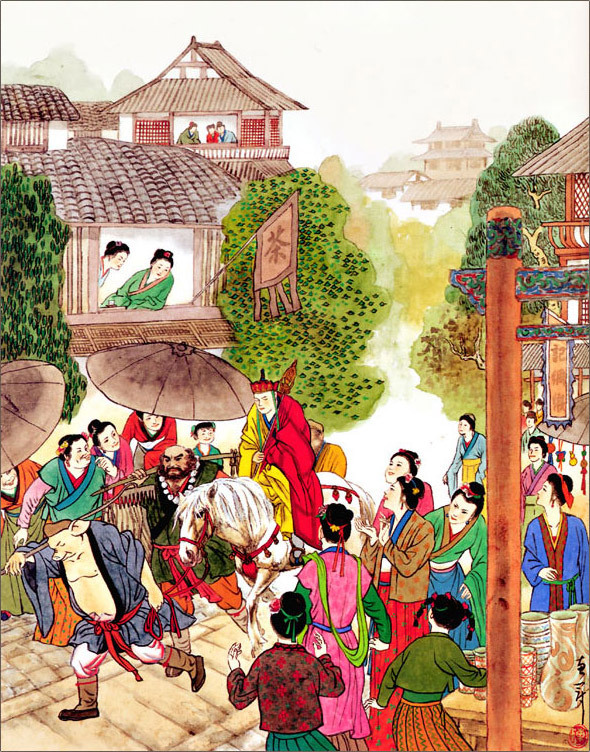 The queen and her entourage accompany the Tang Monk and his disciples to Queendom’s city gates. And the pilgrims set off once more on their 180,000-mile adventure. The Shen Yun 2019 dance The Queendom is inspired by an episode from the classical Chinese novel Journey to the West.